Which water would you choose? Video taken from Springs of the Southwest expedition. Jesus said, “Whoever drinks of this water will thirst again, but whoever drinks of the water that I shall give him it will become in him a fountain of water springing up into everlasting life”! As I was trekking across the White Mountain Wilderness this past weekend, I was in the anchor position. I usually chose this position in the group for the basic reason of being able to encourage those who may potentially be falling behind the rest of the group. I have hiked this trail many times and I knew the awesome wonder that these hikers were going to see! I started to get anxious to see the view again and almost started to pass some of the slower hikers so I could experience the beauty. But I stopped as I noticed some of the hikers were getting tired and discouraged. It is hard to keep on going when the trail is steep and you have no idea of how much further you have to go and you aren't even sure it is something you want to finish! I shared with the other hikers the beauty they would see when they reached the top and encouraged them. They found it within themselves to keep going. Once we hit the summit, they shared how it was so worth the effort they put in to reach the top! As we journey on our Christ life, we go through hills and valleys. In Philippians 3:12-14, Paul wrote, "Not that I have already obtained, or am already made perfect: but I press on, if so be that I may lay hold on that for which also I was laid hold on by Christ Jesus. Brethren, I count not myself yet to have laid hold: but one thing I do, forgetting the things which are behind, and stretching forward to the things which are before, I press on toward the goal unto the prize of the high calling of God in Christ Jesus." Paul was encouraging us to keep on going! Hebrews 12:1-2 also says "Therefore let us also, seeing we are compassed about with so great a cloud of witnesses, lay aside every weight, and the sin which doth so easily beset us, and let us run with patience the race that is set before us, looking unto Jesus the author and perfecter of our faith, who for the joy that was set before him endured the cross, despising shame, and hath sat down at the right hand of the throne of God." We all have friends and loved ones who have already joined Jesus in Heaven. My mom, dad and brother are there. They are experiencing the vastness and awesomeness of Jesus' presence and glory!! They are encouraging me to 'press on' as they have already hit the 'summit' and have seen what I am hoping to see one day! Likewise there are those in our faith families that have already walked where we are currently walking and they have seen the reward of keeping the faith and staying close to the Lord. As a faith family, we should be encouraging those around us who are going through valleys where we have already been and share with them the joy of hitting the summit on the other side! Take heart and Press on! LESSONS FROM THE OUTDOOR CLASSROOM! If you enjoy climbing/mountaineering you know the goal/evidence of climbing many of the US high points is the USGS marker. LESSONS FROM THE OUTDOOR CLASSROOM! This picture is an example of the brittle and broken sandstone and gypsum found in Caprock Canyon, TX. Matthew writes in his gospel, whoever hears His sayings and does not do them is like house that will crumble when the storms of life come. But those who hear his sayings (or Word) and does them, when the storms of life come, his house will remain firm on solid rock! (Matt. 7:24-27) Are you prepared for the storms of life? On whom/what is your foundation? LESSONS FROM THE OUTDOOR CLASSROOM! ReCreation Adventure Ministries teaches the basics in outdoor cooking as a life skill. M.A.W.L. (Model, Assist, Watch, and Leave) The same is true in teaching (discipling) the Christ life. Model the christian life, assist (help) the new believer by doing life with them, watch them (encouraging them along the way) and leave them to disciple or teach others! The Grand Canyon National Park, it’s employees and volunteers, have gone before us blazing and maintaining the trail system for hikers to enjoy. So grateful for first century believers (i.e. Peter, Paul, John, James) who blazed the trail showing us how to live out our faith. Thankful to Alan and Lee Seay who mentored my wife and I in early years of ministry. There is always someone watching how you conduct yourself. Who are you mentoring? Proverbs 27:17, "As iron sharpens iron, so does one man sharpen another." 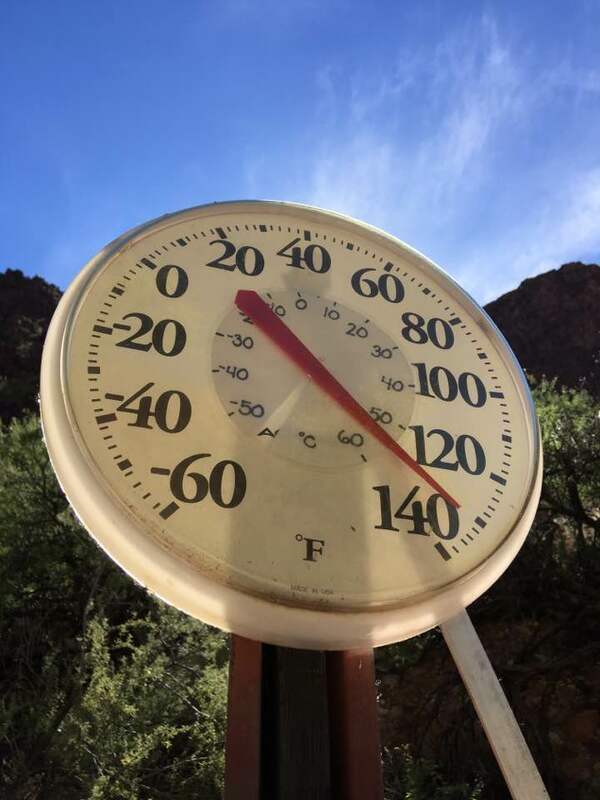 This picture is a thermometer in the direct sunlight at the bottom of the Grand Canyon! Yes, it was hot that day and our group adapted to the temperature. Heard a pastor/friend share recently we need more believers to be THERMOSTATS to change the temperature of our surroundings! Are you a thermostat or a thermometer? In Palo Duro Canyon, Texas there are a few small caves to explore and enjoy. Being in cave brings a sense of protection and refuge. The young shepherd David fled from jealous king Saul for ten years and many times hid in a cave. David expressed in Psalm 57 that God was his refuge and his soul rest in Him! Where is your refuge? Where is your cave? This picture is of course the south rim of the Grand Canyon! Backpacking rim to rim in the canyon brings physical, emotional and spiritual challenges to the forefront. Heat, discomfort, perseverance...just to name a few! But the greatest reward is reaching the opposite end of the canyon! Our greatest goal is hearing our Lord and Savior "well done" because of God's mercy and grace in our lives! Philippians 3:12-14. 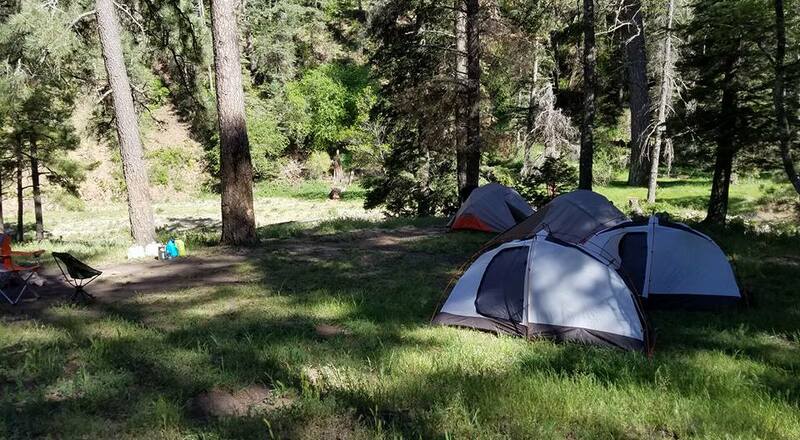 When I lead groups of people into wilderness areas we typically live in rain flys or tents for several days, sometimes a whole week. There are practical and theological reasons for doing this such as remembering our dependence on God in every way. It is significant for the Jews that the Festival of Booths (Leviticus 23) is annual and last for a week. One would not have the same experience if he were sleeping in the comforts of his home at night. The same is true for people enjoying the wilderness. There is something special about having extended time in makeshift accommodations that forges trust in God. Its actually a biblical idea to plan a weeklong camping trip with your family or friends! Don't feel guilty for taking time off to make this happen-it's biblical! Have you ever felt parched? Have ever looked forward to a shower after days without one? Water is such an essential to life. To be able to soak in a creek or pour cool water over your head in a hot environment is exilerating. We cook, drink, clean and bath with it. Jesus spoke about the living water He could provide the Samaritan woman. (John 4:13,14)"...whoever drinks of this water will thirst again, but whoever drinks of the water I shall give him will never thirst. But the water that I shall give him shall will become in him a fountain of water springing up into everlasting life." How refreshing, and can be, is the eternal flow of our relationship with God through Christ!